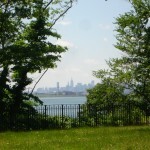 Skyline with trees from Ferry Point Memorial Grove. This pic seems to feature the Manhattan sklline. Where’s the memorial?